For our final day in this part of the world the sun came out – finally! Whether to reward us for our perspicacity, or to taunt us for having to leave the next day, it was still sunshine, and blessed w armth. We departed at 6 AM from our mountainside retreat in Monteverde, slowly descending the many switchbacks that traverse the Pacific side of the Continental Divide, to arrive at the docks at Puntarenas by about 8 AM. 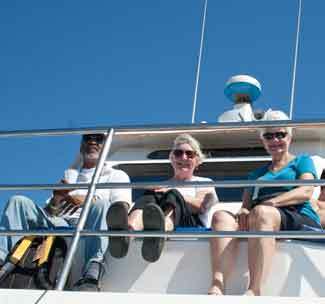 From there we boarded our “day cruise” ship for the two hour sail to Isla Tortuga. 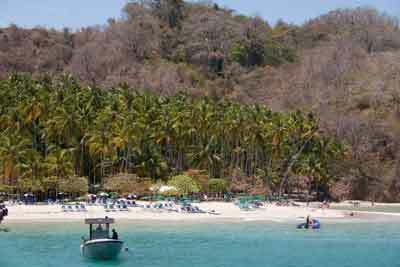 Isla Tortuga is a “day tripper’s” paradise, an uninhabited island in the Bay of Nicoya that is used exclusively by these small ships (about 250 passengers maximum) to provide entertainment and escape for weekend revelers. The cruise line provides the transportation to and from the island, on board musical “entertainment” (depending on one’s definition of entertainment), lunch, and (charge per drink) bar service for the day. Once there vacationers can rent beach chairs, towels, snorkeling gear, go horseback riding, play beach volleyball, or do almost anything else one does at the beach. We of course had a rum-drinking contest. No clear winner, as I recall. Ken O. did get a nice nap as a result, however. 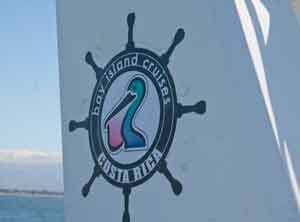 At 4 PM we re-boarded our vessel for the trip back to Puntarenas. Once docked we were met by our bus and its always amicable driver, Hector, who took us on the two hour drive back to San Jose for our final night in Costa Rica. And a short night it was, since we had to depart the hotel at 3:45 AM Sunday morning to make our 7 AM flight back to New York, via Mexico City (and a six hour layover). We landed at JFK right on time, however. And – surprise! – all of our luggage arrived intact and at the same time. I am still letting the experience sink in, and still processing about 550 photos, to decide which ones to post in my online album. I hope to have some overall concluding thoughts to post about the trip in general sometime over the next few days.